As Arctic sea ice habitats melt away, Pacific walruses are foraging in more coastal areas and using beaches for resting. 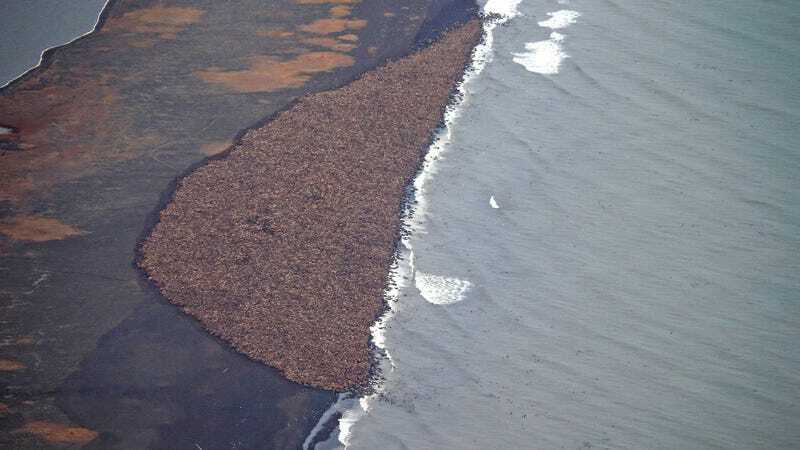 It's a problem that's getting progressively worse, leading to a completely new behavior seen in the species — massive accumulations of walruses packed onto a single shore. Prior to the onset of global warming, walruses used offshore sea ice habitats in the northern Chuckchi Sea as resting platforms in between dives to the bottom of the shallow waters where they feed on their preferred prey — such as clams, snails, and worms — during the summer and autumn. But without these ice habitats, they've had little choice but to find resting spots onshore, including a remote barrier island near Pt. Lay, Alaska. Back in 2011, scientists estimated that 30,000 walruses were hauled out along a one kilometer stretch of beach. But last week, an estimated 35,000 walruses were found crowded onto a beach, according to biologists at the NOAA. It's one of the biggest — if not the biggest — onshore gatherings of the animals documented in Northwest Alaska. Looking at the shocking photos, it's easy to see how dangerous this must be for the animals. This time of year they tend to be females and juveniles, and the smaller walruses are at risk of being trampled to death in stampedes. What's more, the beaches are far from the best spots for feeding, which is at the edge of the continental shelf. According to the NOAA, at least 36 dead walruses were spotted in the thrall. "The massive concentration of walruses onshore — when they should be scattered broadly in ice-covered waters — is just one example of the impacts of climate change on the distribution of marine species in the Arctic," Margaret Williams, managing director of the World Wildlife Fund's Arctic program, said in a statement. Because of reductions in summer and fall sea ice, the U.S. Fish and Wildlife Service is considering granting Endangered Species Act protections to the Pacific walrus. Under a 2011 legal settlement with environmentalists who petitioned for the listing, the service must make a decision by 2017. Sea ice is near its annual low in the Arctic. After six months of melt, ice cover fell to 5.016 million square kilometers (1.94 million square miles) on Sept. 17, the low point of the year, according to the National Snow and Ice Data Center. That was well below the average recorded in the past three decades, and the sixth lowest extent since satellite recording started in 1979, but well above the record low of 3.41 million square kilometers (1.32 million square miles) reached in the big-melt year of 2012. The figure of 35,000 is just a rough estimate. NOAA biologists are planning do to more careful studies of the photos to get a more accurate figure. Images: Corey Arrardo / NOAA/NMFS/AFSC/NMML.